Send us links to your websites, blogs, newsletters or charities of your choice, so we can connect with you in the near future. Look forward to engaging with you by raising awareness and have meaningful discussions on topics that impact building design, health and well-being of individuals and greater communities. This e-network is free to register. * Please keep the posts positive. We have a strict no-promotion policy and unwanted adverts will get removed if they are spammy. Send us links to your websites, blogs, newsletters or charities of your choice, so we can connect with you in the near future. Delivering modern health care facilities on time and on budget requires tried and trusted construction solutions. 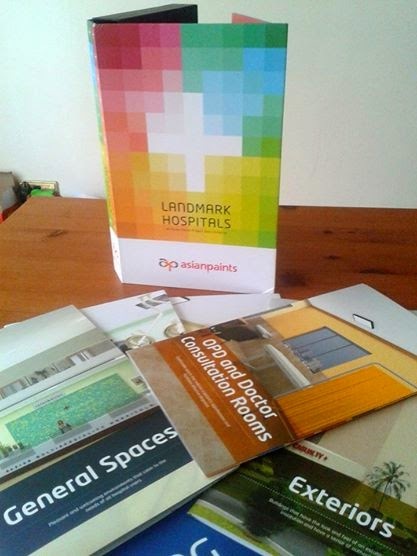 First of its kind healthcare brochure for one of the largest Indian paint company. This paper presents brief preliminary outline for current Healthcare Innovation funds and its pre-requisites. And then summarises, list of recommendations and available options for healthcare providers. This article on published on an exclusive hospital infrastructure portal talks about Colours and how they bring out responses in the body by energizing it. .
© Copyright 2006 - 2016. Awesome Inc. theme. Powered by Blogger.